What can you expect? 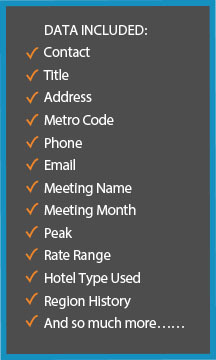 Full organization and contact information along with major meeting information such as number of rooms on peak, rate ranges, hotel types, timeframe, phone, email when available, as well as a variety of other relevant meeting information. When is the data available for download? Immediately if you checkout by credit card, and one-three days if checkout via invoicing method. How do I download the data? After you hit process order in Checkout, you will receive a confirmation on the screen. Go to the My Account tab and your order will be available for download. Simply hit the Export button, and download your data immediately. Simple, fast and easy to use!